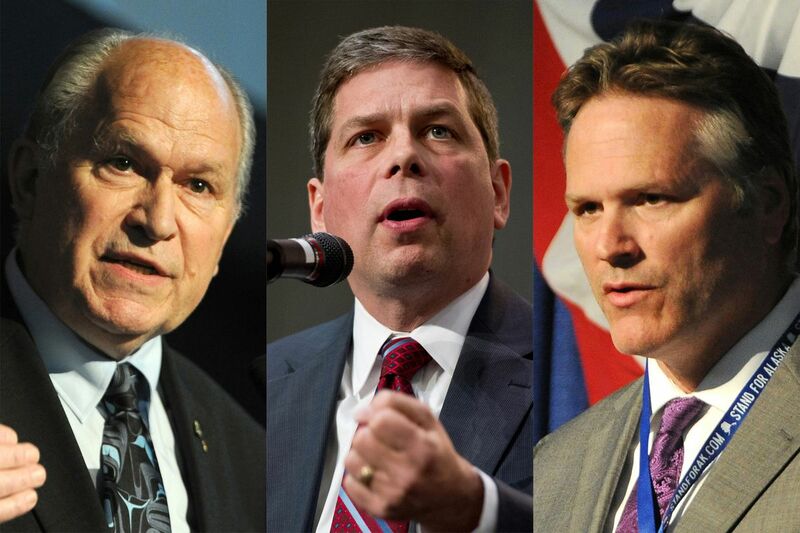 Candidates for Alaska governor put a spotlight on crime. But what are they going to do about it? The three leading candidates for Alaska governor have all made crime a main talking point in their campaigns. Gov. Bill Walker, an independent, Democratic former U.S. Sen. Mark Begich, and Republican Mike Dunleavy, a former state senator, have some overlapping thoughts. They all mention the importance of various law enforcement agencies working together, and the need to address Alaska's opioid crisis. But they differ when it comes to some specifics, and how they might fund their plans. Alaska's crime rate went up 6 percent last year compared to 2016, according to figures released by the state Department of Public Safety last month. Anchorage set a record for homicides in 2017, and the value of stolen goods in Anchorage topped $45 million. Alaskans are fed up, and some think 2016's criminal justice reform law Senate Bill 91 is to blame. So how, exactly, do these candidates for governor plan to address crime and public safety? And how do they want to pay for it? All three candidates said in recent interviews they want to work to fill dozens of Alaska State Trooper positions that are currently empty, and find better ways to retain those workers. They've also said their approaches to public safety would involve addressing the state's opioid crisis, which Alaska Attorney General Jahna Lindemuth has said is tied to rising crime rates. Unlike his opponents, Dunleavy hasn't published a formal plan for how he would address public safety. There is a section on his website titled "Make Alaska Safe Again" — a nod to President Donald Trump's campaign slogan — where he says he wants to fully repeal SB 91. Dunleavy said he is working with various groups to come up with a comprehensive approach to public safety in Alaska, but he wouldn't identify the groups. His plan would probably come out right after the election, he said. “I’m busy campaigning, and I can’t devote all my attention to the intricacies of the plan,” he said. Some of Dunleavy's priorities for public safety: "Make sure we have the right number of prosecuting attorneys," return the courts to regular business hours on Fridays, and work with the federal government keeping illegal drugs out of Alaska, he said. "And we have to make sure we have enough corrections officers in our facilities who are ready to handle what could be potentially, initially, more inmates," he said. As part of his approach on crime, Begich said he would start by creating a "mini-cabinet" of leadership from various departments, including the state Department of Corrections, Department of Health and Social Services and Department of Public Safety. Then, he would give them a brief time frame to identify and lay out the problems. "You can't just hire more troopers and hope it all works," Begich said. Sharon Chamard, an associate professor at the University of Alaska Anchorage Justice Center, said there isn't a clear relationship between the number of police officers in an area and the amount of crime in that area. "But still, there comes a point where you're just lacking adequate police services in an area," she said. "The police do a lot more than just deal with crime, and they have a lot of other functions." Begich also said he would support a repeal of SB 91, but added that if that happens, legislators need to have a plan to replace it. The plan on Begich's website includes treatment for substance abuse and mental health, investing in local police through state revenue sharing, state partnerships with federal prosecutors, and working with rural communities to "create more opportunities for tribal courts, community courts and Wellness Courts to be empowered" in the judicial system. The Anchorage Police Department Employees Association endorsed Begich earlier this month. In a statement, the group cited Begich adding 80 police officers and placing two prosecutors in the U.S. Attorney's office when he was Anchorage mayor. The union represents more than 500 employees. The Walker administration last year introduced a "public safety action plan," which gets updated online as progress is made on the list of changes it lays out for the criminal justice system, public safety resource needs, drug trafficking, and mental health and substance abuse treatment access. Some items Walker is working on through that plan include expanding crisis intervention training for law enforcement, adding drug dogs to agencies to help catch traffickers, and creating a statewide domestic violence and sexual assault hotline. Last month, Walker announced a 7.5 percent raise for state patrol and wildlife troopers to try to draw new troopers and also keep the existing ones from leaving the job. He said his administration plans to ask the Legislature to fund another 7.5 percent increase for troopers. "They're leaving because they're not being paid a competitive wage," he said in an interview. "They can go to work in King County, Washington, and make more and have a better benefits package and so why would they not do that?" Walker signed SB 91 into law. He now says that while he thinks the intention behind the law was good, the controversial criminal justice reform bill "went too far." He later signed Senate Bill 54, which dialed back some of the changes from SB 91, and said he plans to seek more adjustments on things like sentencing guidelines. Dunleavy said his administration would work on developing drug aversion programs for kids, starting in elementary school. The state also needs to stiffen the penalties for drug crimes, he said. "We have to send a message that we're not going to tolerate drug dealing in the state of Alaska, especially when it comes to opiates — heroin and fentanyl," he said. Begich also said there needs to be harsh penalties for people selling and distributing opioids. "The big challenge is treatment and making sure we have a pathway for these folks to get off, or have a cleaner lifestyle," he said. In February of last year, Walker issued an order that declared the state's opioid crisis a public health disaster. He said progress has been made under his administration, including the distribution of thousands of Narcan kits used to reverse the effects of an opioid drug overdose. There's still work to be done, he said. "I'm not sure we can completely arrest our way out of this," he said. "We need to treat our way out of this as well." How will they pay for their plans? None of the candidates have been very specific about how they want to fund their plans for public safety and addressing crime. Walker said that after the cuts his administration has made to the state's budget, there's not many more places left to trim. "We've cut. We're done cutting," he said. He sees it now as a choice between continuing to draw from the state's savings, or developing new revenue streams. "There's no question, the price of oil has stayed up — certainly does help," he said. "I'm not afraid to talk about new revenue. I don't like any sort of taxes. I absolutely don't. But I recognize we have to figure out how we're going to fund the services we provide. It's a fairly basic concept." Asked whether he would cut other parts of the budget or create new revenue to fund his plan, Begich said it might take a combination of those approaches. "I don't have the luxury of the budget in front of me," he said in a recent phone interview. "If you start with, 'We don't have the money,' then you'll never solve this problem." Dunleavy pointed to state positions over the past year that were funded but not filled, and said some of that money could be shifted to paying for troopers and prosecuting attorneys. "We're looking at shifting some of those costs from within the budget into public safety," he said. "And just managing our Health and Social Services programs and our Medicaid programs, many believe we could render $100 to $150 million in savings just from efficiencies there. This is before you even talk about reductions." Chamard, at UAA, said criminal justice is an expensive and a labor-intensive field. "It's kind of odd to me how you'll often find people, not necessarily politicians, say, 'We want more police, we want more people in prison,' but on the other hand they say, 'We want less taxes,' " she said. "I don't understand how these two kind of policy ideologies can coexist because to me they're somewhat contradictory." She also said she'd like to see the candidates take longer-term, preventive approaches to crime, like supporting high-quality preschool and prenatal care. "We have more crime because of a variety of social reasons," she said. "So if you think the answer to crime is to put more into criminal justice, then that's not getting at the full picture."